To roam the streets in Monrovia, at night is not safe at all. These boys need a home. Provision of Hope is working on getting beds for them, in one of our Hope Homes. We are praying for help. Pastor Malcolm has befriended these boys for some time now. When Alvin was 4 we helped him with a surgery. Recently Calvin was very sick and was taken to get medical treatment at the hospital. Would someone like to sponsor these boys? They could start school this September. I pray that they will be safe until we find a home for them. This need is urgent. Join me in prayer! And when He comes… EVERYTHING CHANGES! Dear Ma Karen, my heart melt when I read the account of Alvin and Calvin, I wish I had a three bedroom apartment, but I will share this information with my manager ( wife). Because it requires extra helper to my wife to caters these children but I will get back to you soon. Calvin and Alvin, has a bright future and we can just sit and watch the devil destroy their destiny. Oh Lord help these little ones in Jesus Name. I KNOW that God has his hand on these boys, and that there will be a home for them very, very soon. Please talk to Pastor Malcolm and decide on a plan. Where should they go? How are Alvin and Calvin doing? I find it so difficult to compare lives. Here I sit in my my house. I have a car that takes me to a superstore where I can buy everything my family needs. My safety and comfort is assured by the police man that lives next door, a church 10 minutes away and a family that abides in love. How can I help? 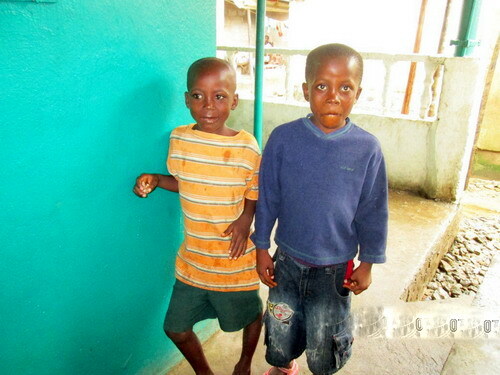 Thank God that Alvin and Calvin are now living in one of our Hope Homes with caring parents, Eric and Kamah! They are outstanding with the many children they care for. They are also running a Children’s Ministry in their community in Caldwell. How can you help? Any chance you want to donate towards clothes for the boys, or beds, blankets, and that kind of thing. Remember: “Little is much when God is in it!” Eric and Kamah are stuffed into a 2 room apartment with 13 children. They really need a bigger place, when their rent becomes due this coming March. I hope we have the funds when the time comes. I keep trusting God for everything! !